Strawberries and Buttercups: These are amazing! The stamps above were my collection of stamps to use. It looks like a lot but when sticking these gems to envelopes I could easily use 3 at one time per envelope, sometimes more which means that they run out so quickly that at least every 2 months I need to buy some more. I knew already that I needed to buy some more lower value stamps but when looking on eBay I couldn't bring myself to spend 50p on a 20p stamp, even today when I looked there was a £1 stamp going for £5! Its great if you're a collector but I wanted some to use. Just by chance the other day I came across a listing for a bag of stamps selling for under their value so I bought them. They are absolutely amazing and I spent some hours admiring each and everyone of them as well as sorting them out in to their sets. Its going to be so hard to use them when the time comes. However I started putting them in to little plastic wallets when I ran out. I ended up buying some more wallets but as I was puttng the rest in to them I just thought I could easily lose some and I wouldn't know about it. About 2 weeks ago I purchased a stamp album for these stamps I received in this post and for some others that I received recently. I'd put those stamps in already but ended up taking those out to put these ones in. I managed to put all my small value stamps in to the album but not the ones in the first photo. 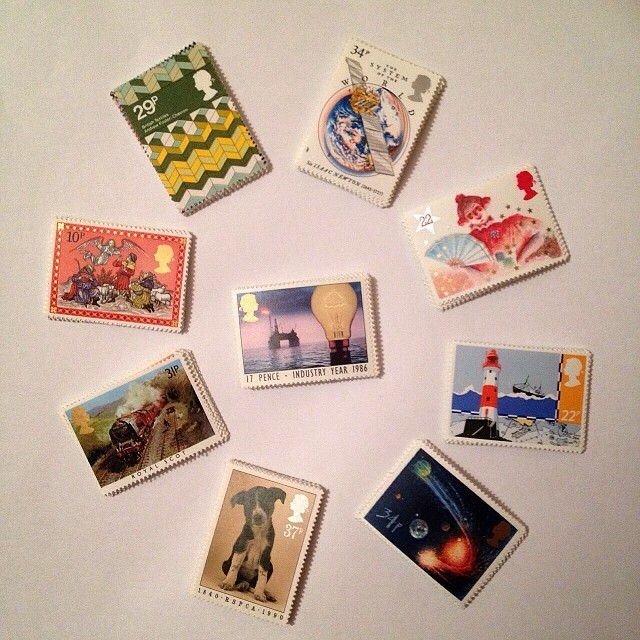 I really want all my stamps in one place and before I even purchased these ones I was already thinking that I need to find an alternative way to store the ones I have as they are all in an A4 envelope that Royal Mail sent with my first stamps a year ago so its starting to look a bit worse for ware. I've now ended up buying a 64 page album to put all my stamps in and hopefully that will arrive soon. 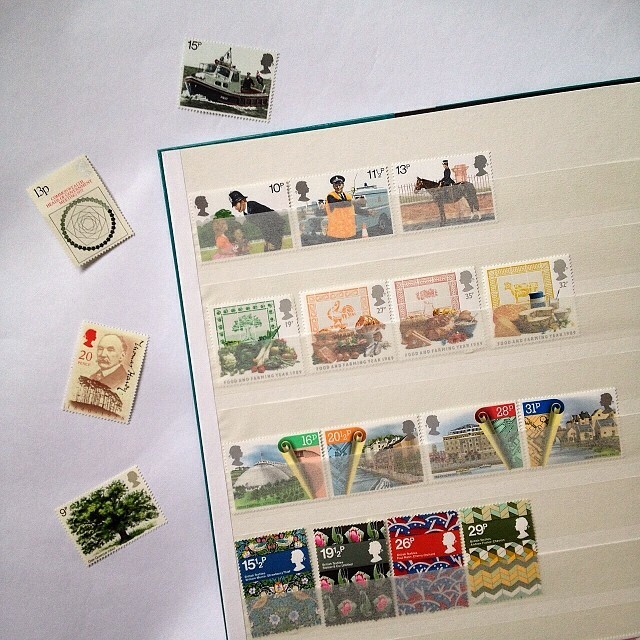 I've sorted all my stamps in to set, then small value to large... very OCD I know. I did consider putting all of the same price stamps together but I'm glad I didn't as it has the wow factor every time I open the album and I then can't help looking at every page. Once I get my bigger album it will be even better to have my main stamps in their too but I know already I'll have to put them in first as they are the ones I mainly use. How do you store your stamps? Oooh I love the old stamps! Sadly, over here we can only use the Euro stamps, so even though I do have inherited some stamps that are a few decades old, I can't use them. I store my to use stamps in different envelopes, I'm not that organized ;-) There is an envelope for national postcards, for national letters, for international mail, one for lower values and one for higher values. The lower value ones all are standard stamps, meaning only flowers, the varied stamps only begin at 45 cents (for postcards). Its sad that you can't use the old stamps as Holland have only just discontinued them now. I have had people in Germany write to me but they always use the same stamps so I'm curious to know if you have exciting ones to use too now? We do have exciting stamps - just not the old ones. I think the German Post Office issues around 50 new stamps each year - there are some series, where each year something is published - like the lighthouses, Christmas stamps, timbered houses, or the recently started series of panoramic photos where two stamps form one picture, but mostly they are about anniversaries of famous people, events, sometimes also cities or buildings. They issue about four stamps of the international value each year, so I often use the national ones and add flowers stamps to reach the international value. well you and i have something in common. i love that you want to use older stamps, not just collect. i don't collect at all, i just want to use vintage ones because they are sooo much more interesting. today in canada it's like we've all agreed to only have the things that "represent" our country on our postage stamps. so it's ALWAYS flowers, animals and hockey players. sometimes they switch it up but there is rarely ever anything pretty or arty. 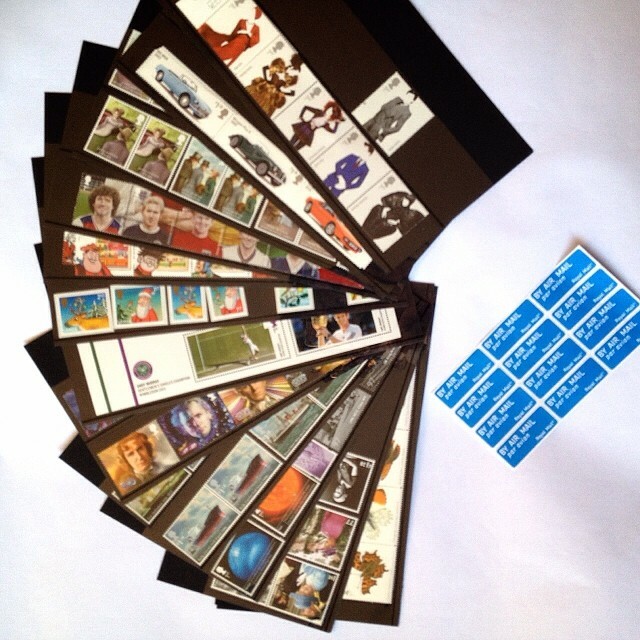 i get my unused vintage stamps from "send more mail". but it's like you said, you have to use about 5 to make today's postage amount! Actually British stamps have always been really nice, its just that there came a point where they stopped selling them in little booklets for everyone to use, you can only get the typical queens head that way now which I get bored of. I just love having smaller value stamps in order to make my whole package colourful but also to use slightly less stamps as I'm struggling for space to even write the address. That's so true but somethings I don't know and learn from it.